1. Agorhom, E.A., Lem, J.P., Skinner, W., Zanin, M., (2015) Challenges and opportunities in the recovery/rejection of trace elements in copper flotation - a review, Minerals Engineering, vol.78, pp. 45-57. 2. Agorhom, E.A., Skinner, W., Zanin, M., (2015) Post-regrind selective depression of pyrite in pyritic copper-gold flotation using aeration and diethylenetriamine, Minerals Engineering, vol.72, pp. 36-46. 3. Agorhom, E.A., Skinner, W., Zanin, M., (2014) Diethylenetriamine (DETA) depression of Cu-activated pyrite hydrophobised by xanthate, Minerals Engineering, vol. 57, pp. 36-42. 4. Agorhom, E.A., Skinner, W., Zanin, M., (2013) Influence of gold mineralogy on its flotation recovery in a porphyry copper-gold ore, Chemical Engineering Science, vol. 99, pp. 127-138. 5. Agorhom, E.A., Skinner, W., Zanin, M., (2012) Upgrading of low-grade gold ore samples for improved particle characterisation using Micro-CT and SEM/EDX (revised), Advanced Powder Technology, vol. 23, pp. 498-508. Agorhom, E.A., Zanin, M., Skinner, W., (2014) Effect of diethylenetriamine and sodium metabisulfite on xanthate-induced flotation of Cu-activated pyrite, UMaT 3rd Biennial Mining and Mineral Conference, Tarkwa, 30th July – 2nd August. Agorhom, E.A., Zanin, M., Skinner, W., (2014) Selective depression of pyrite and its implications on gold flotation behaviour in porphyry copper-gold ore, 29th Australia Colloid and Surface Science Student Conference (29th ACSSSC), Ballarat, VIC, 3-7th February. Agorhom, E.A., Skinner, W., Zanin, M., (2013) Pyrite-gold separation from copper rougher flotation tailings, CHEMECA 2013, Brisbane, Australia. Agorhom, E.A., Zanin, M., Skinner, W., (2012) Effects of gold composition and surface chemistry on flotation and collector adsorption properties, 28th Australia Colloid and Surface Science Student Conference (28th ACSSSC), Newcastle, NSW, 3-7th February. Agorhom, E.A., Skinner, W., Zanin, M., (2011) Upgrading of low-grade gold ore samples for improved particle characterisation using Micro-CT and SEM/EDX, CHEMECA 2011, Sydney, Australia, 8-21ST September. 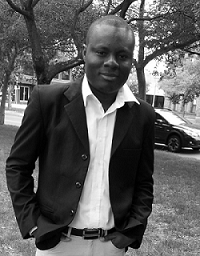 Timbillah, S., Aabulleh,P.N., Agorhom, E.A., (2007) Iron Ore Surge in the World_The Role of Ghana, Iron Ore 2007, AusIMM, Perth, Australia, 20-22nd August, 2007. Copyright © Eric Aminartey Agorhom. All rights reserved.